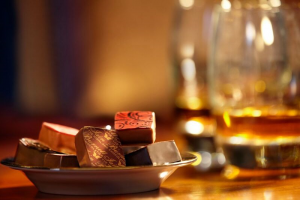 More and more distilleries are now pairing up drams with chocolates, why? Chocolate and whisky go together very well. 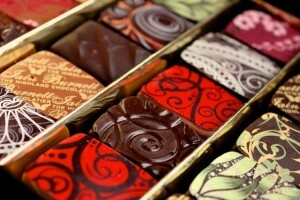 The complex nature of whisky complements the luxurious texture of good chocolate. We have teamed up with Iain Burnett. 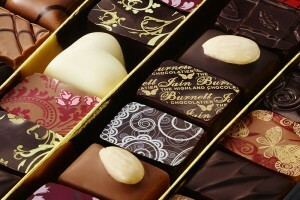 Iain has become world renowned for his chocolate pairings with some of Scotland’s favourite distilleries. We are working with Iain on a limited edition box of chocolates to accompany this tour (in addition to the distilleries we visit which already hold his product) ; please note, these chocolates are to pair with whiskies shown NONE of these chocolates contain whisky. Here are some of the chocolates in the presentation box of 20. Raspberry & black pepper velvet truffle, Orange & hint of clove velvet truffle, Cinnamon & clove velvet praline, Passion fruit & hint of mango velvet truffle, Lemongrass & hint of lime velvet praline and Nigerian ginger velvet truffle. So to the tour We can start anywhere; Edinburgh, Glasgow, Aberdeen or Inverness. Once on the road, we open a bottle of course and share a dram and a chocolate. En route to Speyside, calling in at one of our favourite places, Glen Moray Distillery. Here we have a tour and taste, we leave it to the experts on your drams, once complete we head away down to Craigellachie for lunch, before heading up to Cardhu Distillery, where we taste the whole Johnnie Walker range, in the exclusive library rooms. We retire to Elgin and check into our hotel, the Mansfield. Today we will be enjoying drams and chocolates on the road. Day two after breakfast we drive to Glenallachie Distillery for a private tour here, home to Billy Walker’s new whiskies. This afternoon we head to Glenlivet Distillery for lunch, followed by a tour and taste. Today we will be enjoying drams and chocolates on the road. Return to Elgin, at the Mansfield. Day three we drive west along the Great Glen, stopping at Loch Ness and Drumnadrochit, taste drams and chocs! We end today with a distillery tour in Oban, where we stay overnight. Day four 14 miles or so south of Oban, we stop at Seil Island, admire the views, enjoy drams and chocolates before free time to quench your thirst at the Oyster Bar, local beers, whiskies and food all available. Return to Oban and call in at the whisky shop for a wee tasting. There are many bars in Oban and grand restaurants, Paul knows them all – he was born near here! Overnight Oban. Depending on the weather, we will add more to today. Day five touring through stunning scenery we are heading to Perthshire, via Glencoe, Killin ending at Aberfeldy to take a tour at Aberfeldy Distillery, maybe even blend your own whisky? For lunch we head along to Iain Burnett’s Highland Chocolatier at Grandtully, here we shop for more chocolates, then partake in lunch next door at the Tully and share a drink or two. The day ends in Perth. Come along to Paul’s local pub tonight, a drink and look down at where King James was murdered! End the night at the Venue pub, over 250 whiskies behind the bar. Day six the final day of the tour, after breakfast we drop into Tullibardine Distillery, where we take the tour, followed by a grand range sampling in their excellent tasting room. From here we either end the tour at Edinburgh or Glasgow.